Posted December 10th, 2012 . Aw, what a sweet face! Oh my god! My cocker spaniel does the same things!! Little monkey! Your parents should buy you cartons of tennis balls! my Aussie mix does the exact same thing!! But she will do it right in front of us!! Silly dogs! Be careful with that. One of mine ate a tennis ball and it made him very sick. He threw up so many times that he started to shake. I was very worried it would be the end of him. 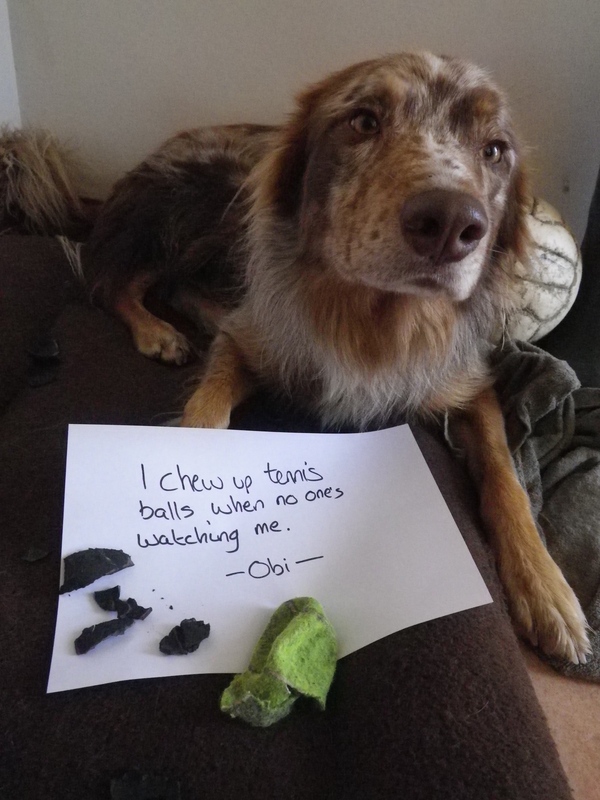 Obi’s face is so adorable that I just want to buy him more Tennis Ball’s. It’s my inability to refuse furry faces that has my Woofie spoiled rotten! Our bull terrier, Sweet Baboo, ate a tennis ball. It was 5 days in doggy hospital with a surgical bill of $1800, because a piece got stuck, his stomach got blocked, and he started eating everything hoping he would vomit. Be careful!